Originally published in EastBayRI newspapers October 12, 2016. I just spent an hour scrolling through dozens of images of spiders — some of them much too close-up for comfort — to answer a question that must be at the front of your mind if it’s plaguing mine. Why are there so many spiders around in the fall? I hope you’ll spare yourself a nightmare-inducing internet search because I found the answer: there aren’t so many. Just the usual amount. Granted, some have matured to their full glory, more visible than invisible the bigger they get. And dewy mornings are turning our gardens into galleries of exquisite web art. I used to be terrified of spiders. As a child my arachnophobia was nurtured by a family member who pretended to catch daddy-longlegs between thumb and forefinger and chase me around the house. Hilarious and character-building? Maybe. One time, as an adult, I levitated across an impossible span of chairs to avoid touching the same floor traversed by a spider my peripheral vision insisted was the size of a puppy. (It wasn’t quite that big.) That night I became my own hero by relocating said spider, without assistance and while adrenaline gave me the shakes, and started down a cobwebby path to desensitization and appreciation. We all know it’s bad luck to kill a spider. Contrary to popular nightmares, even the venomous ones mean us no harm. Spiders are voracious and indiscriminating insectivores and will only bite humans in near-death defense, not for supper. But anything that gets caught in their webs without breaking right through is fair game. Aphids, yellow jackets, mosquitoes, flies, you name it. The more bothersome the insect, the more gratifying it is to see it wrapped like a burrito. It’s much less enjoyable to witness the entanglement of honeybees, bumbles, and butterflies — some occasion rescue efforts — but that’s nature and nature is cruel. I mean cool. Nature is cool. Of course, not all spiders spin webs. Some, like the bold jumper (that’s really its name) that lives in my mailbox, stalk their prey. I have also encountered what is either a broad-faced sac spider or woodlouse spider when I’ve been planting or weeding the garden. The former spends its days resting in leaf litter and hunts at night; both are a startling shade of red. The seeming proliferation of spiders has prevented me from completing some of my garden chores. I’ve been meaning to bring container plants inside but I hate to disturb the webs. Most are classics spun by very fat and happy cross orbweavers. A few grass spiders have taken up residence within the vortices of funnel webs. Fascinating creatures. I’d rather they stay outside. They would too. — Most of us assume spiders will try to come inside right about now looking for warmth. That’s a myth; they’re “cold-blooded”, not heat seekers. That said, there are spider species — all benign in this neck of the woods — that have adapted to indoor living and are unlikely to survive long outside particularly if relocated now. Frost is the end of the line for some garden spiders too but they will have been busy ensuring the next generation’s eggs are tucked up in a sac somewhere safe for the winter. As careful as I try to be, my houseplants do sometimes arrive inside with hitchhikers. Last year a grass spider spent the winter under her sheet web in an aloe, a plant I rarely water. Poor thing was probably thirsty but managed to survive for a while on what must have been a limited diet of house spiders and the odd aphid or fungus gnat. You already know I have a lax attitude about housekeeping and am grateful to anyone who helps tidy up. That’s a long way to come from the utter terror I used to feel. My first close-encounter with an enormous black and yellow garden spider nearly gave me a heart attack. Now I get a little adrenalized thrill when I spot her telltale zipper (a bird alert) in a web. I do prefer to appreciate spiders from a certain distance but the more I see in my garden the luckier I feel. Truth be told it has been many years since I’ve seen a black and yellow garden spider in my garden or anyones else’s. Seen any in yours? — Do you have love or fear or both? Originally published January 21, 2015 in East Bay/South Coast Life. I read recently that, just as gardeners should learn the lay of the land for at least a year before starting a garden, a new homeowner should move in before repainting. Good advice I would have been much too impatient to heed back when my carpenter and I first took possession of a purple living room and a yard like a blank slate. 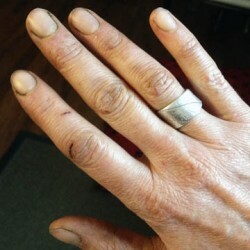 But while I enjoy moving plants around and changing the garden with every better idea, repainting is a tedious chore. I’ve had to change the color of my living room walls twice now. I didn’t find the right color until I started growing a bear’s paw fern and watched how the afternoon light moved through it. For a long time I lacked the confidence to grow ferns as houseplants. One after another—a maidenhair, mother fern, and table fern—succumbed to quick and demoralizing deaths. I assumed that my house must not be humid enough, despite the contrary evidence of perennially fogged windows. I thought that until I lived in a rainforest or a shaded greenhouse with drains in the floors, I’d never be able to meet their cultural requirements. But I have a thing for ferns. The way new fronds uncurl like the primordial creatures they are…The shape of mature fronds in silhouette…The candy-button-like dots of spore-producing sori on the fertile fronds’ undersides…The memory of grade-school science lessons about one of the more fascinating ways plants reproduce…And I’m always game for a challenge. I kept bringing them home and I’m glad I did because it turns out footed ferns are the ferns for me. Footed ferns are so called because the fronds emerge from an epiphytic criss-cross of fuzz covered rhizomes spilling over the soil’s surface, and the tips do resemble paws if you let your imagination run wild. Rabbit’s foot fern (Davallia fejeensis) rhizomes might bring to mind the luridly dyed severed rabbit’s foot key chains we carried in our pockets for luck during the 1970s (what a disgusting fad that was). I prefer to creep myself out by imagining a nest of tarantulas instead. So cool. 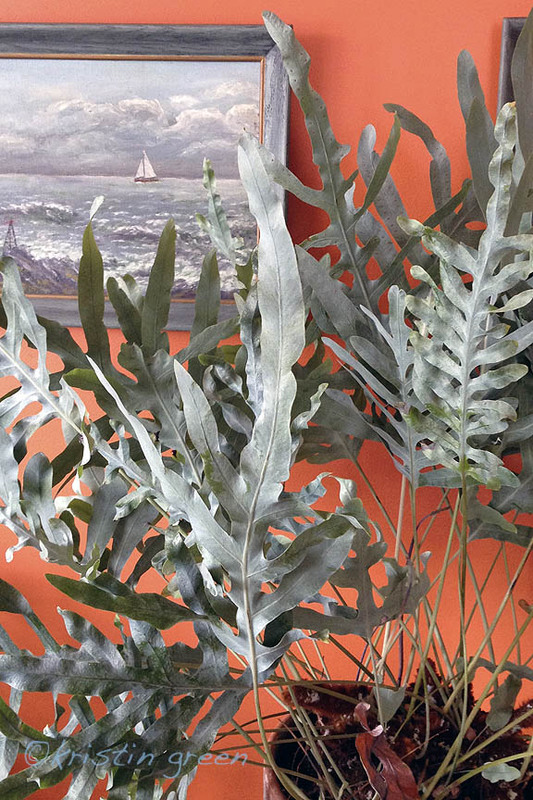 The fronds, by contrast, are elegantly lacy with deeply cut bronzy leaflets (called pinnae in botany-speak) that become deep green with maturity. 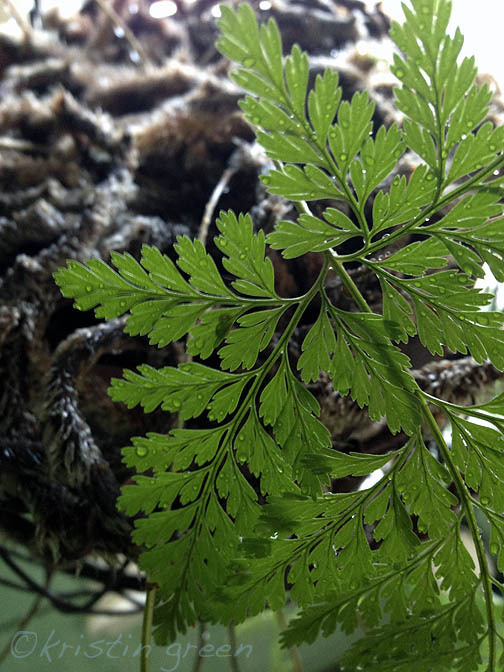 Naked rabbit’s foot fern (Polypodium formosanum) is also known as caterpillar fern, worm fern, grub fern, and E.T. fern because its finger-like sea-foam-green rhizomes have no hairy scales. 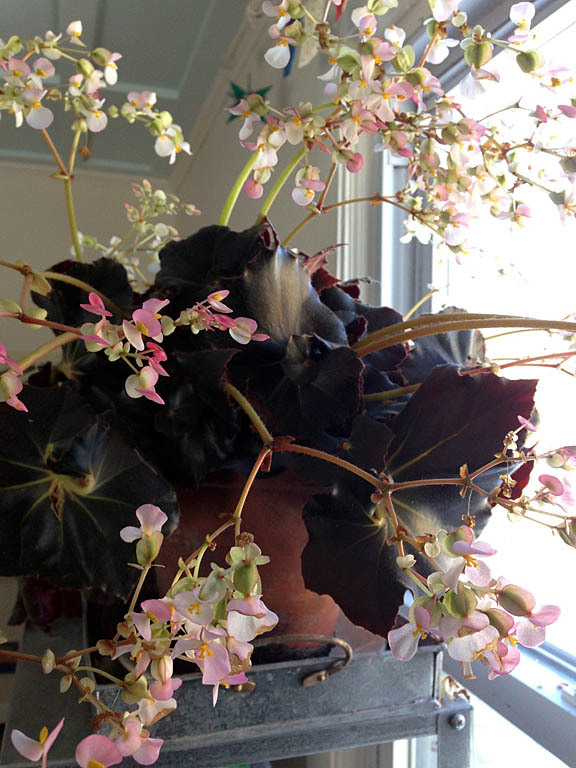 But they do have creepy appendages that help anchor the plant to its host, or in the case of mine, hug an adjacent piece of souvenir driftwood and root into a neighboring begonia. Worm fern’s chartreuse rickrack fronds arch gracefully from all the oddity at its feet. The superstar in my household is a bear’s paw fern (Phlebodium aureum ‘Blue Star’) with wavy fronds so glaucous I was inspired to paint my living room pumpkin orange to bring out their blue. Its rhizomes are much thicker, more bear-like than the others, but are taking their time to lumber over the pot edges. The best thing about footed ferns, aside from the coolness of their weirdness, is that they’re forgiving. 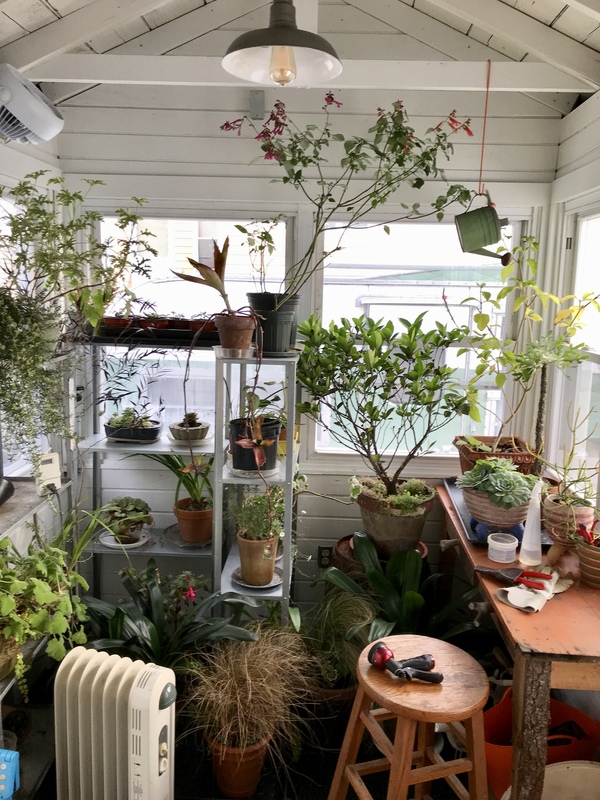 They do require humidity—I keep a rabbit’s foot fern in the bathroom and the worm fern in an open terrarium—but they can tolerate much more winter dryness than, say, a maidenhair. They don’t seem to be as temperamental about watering either. The soil may go dry between drenchings and for that I use the shower once per week. And as long as they don’t get direct sunlight during the spring and summer, all is well. 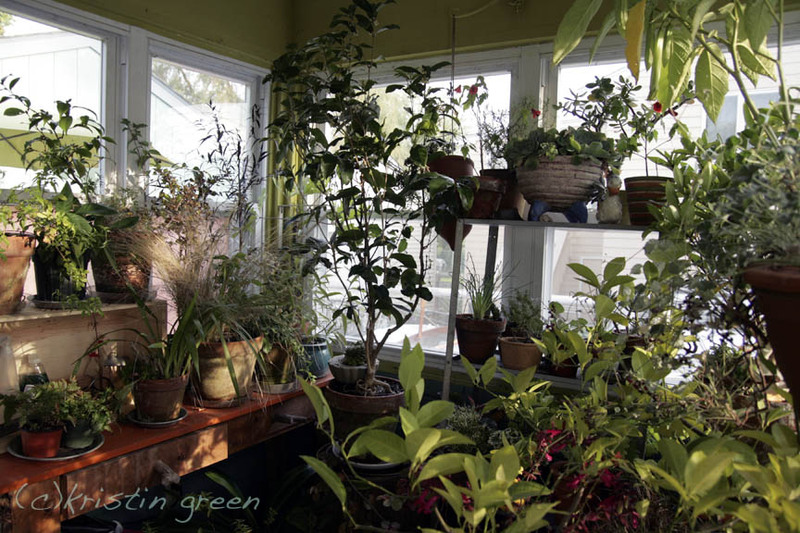 During the winter, east windows are prime real estate, as are shelves that catch a little afternoon sun, perhaps with a complementary color on the walls behind to bring out the best in their silhouette. 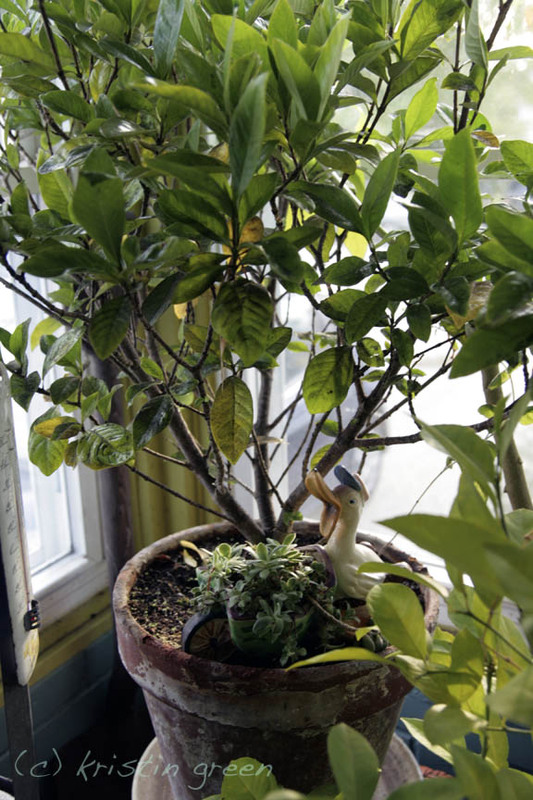 Do you grow ferns as houseplants? Which ones? Have they inspired any interior design changes?